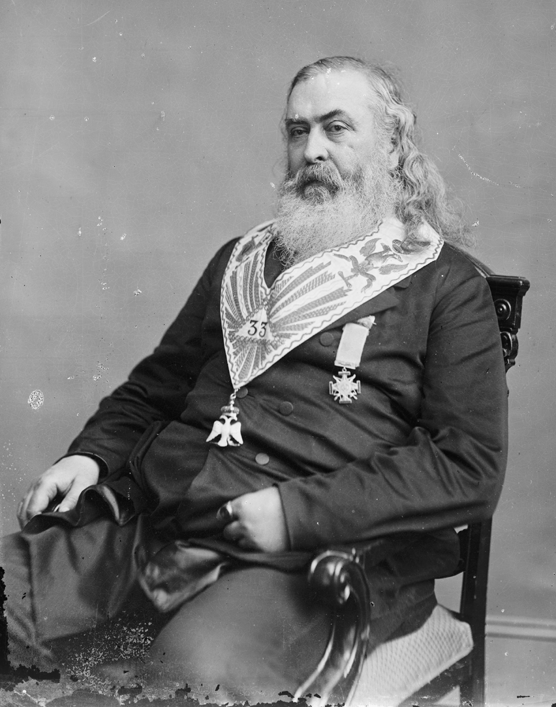 This collection of Albert Pike Quotes comes from the Apprentice Degree in Morals and Dogma. While one could extract all manner of quotes from the book, these struck me as most succinct of his teachings as they seem to emit double or triple understandings to their meaning. As he progresses in the degrees you can definitely sense his take on the the more esoteric side of the fraternity, of which this is a taste. FORCE, unregulated or ill-regulated, is not only wasted in the void, like that of gunpowder burned in the open air, and steam unconfined by science; but, striking in the dark, and its blows meeting only the air, they recoil and bruise itself. The blind Force of the people is a Force that must be economized, and also managed, as the blind Force of steam, lifting the ponderous iron arms and turning the large wheels, is made to bore and rifle the cannon and to weave the most delicate lace. It must be regulated by Intellect. Intellect is to the people and the people’s Force, what the slender needle of the compass is to the ship–its soul, always counseling the huge mass of wood and iron, and always pointing to the north. Thought is a force, and philosophy should be an energy, finding its aim and its effects in the amelioration of mankind. The two great motors are Truth and Love. The POWER of the Deity Himself is in equilibrium with His WISDOM. Hence the only results are HARMONY. Deeds of daring dazzle history, and form one class of the guiding lights of man. They are the stars and coruscation from that great sea of electricity, the Force inherent in the people. To strive, to brave all risks, to perish, to persevere, to be true to one’s self, to grapple body to body with destiny, to surprise defeat by the little terror it inspires, now to confront unrighteous power, now to defy intoxicated triumph–these are the examples that the nations need and the light that electrifies them. It is the force of the people that sustains all these despotisms, the basest as well as the best. Less glory is more liberty. Thus the spirit of liberty and innovation is reduced by bayonets, and principles are struck dumb by cannon-shot; while the monks mingle with the troopers, and the Church militant and jubilant, Catholic or Puritan, sings Te Deums for victories over rebellion. The force of the people is exhausted in indefinitely prolonging things long since dead; in governing mankind by embalming old dead tyrannies of Faith; restoring dilapidated dogmas; re gilding faded, worm-eaten shrines; whitening and rouging ancient and barren superstitions; saving society by multiplying parasites; perpetuating superannuated institutions; enforcing the worship of symbols as the actual means of salvation; and tying the dead corpse of the Past, mouth to mouth, with the living Present. Despotisms, seen in the past, become respectable, as the mountain, bristling with volcanic rock, rugged and horrid, seen through the haze of distance is blue and smooth and beautiful. The sight of a single dungeon of tyranny is worth more, to dispel illusions, and create a holy hatred of despotism, and to direct FORCE aright, than the most eloquent volumes. The FORCE of the people, or the popular will, in action and exerted, symbolized by the GAVEL, regulated and guided by and acting within the limits of LAW and ORDER, symbolized by the TWENTY-FOUR-INCH RULE, has for its fruit LIBERTY, EQUALITY, and FRATERNITY,–liberty regulated by law; equality of rights in the eye of the law; brotherhood with its duties and obligations as well as its benefits. The unknown is an ocean, of which conscience is the compass. Thought, meditation, prayer, are the great mysterious pointing of the needle. It is a spiritual magnetism that thus connects the human soul with the Deity. It is but a shallow scoff to say that prayer is absurd, because it is not possible for us, by means of it, to persuade God to change His plans. Our free agency and our will are forces. We do not absurdly cease to make efforts to attain wealth or happiness, prolong life, and continue health, because we cannot by any effort change what is predestined. If the effort also is predestined, it is not the less our effort, made of our free will. So, likewise, we pray. Will is a force. Thought is a force. Prayer is a force. Every Lodge is a Temple, and as a whole, and in its details symbolic. The Universe itself supplied man with the model for the first temples reared to the Divinity. It is the Master of this Lodge, of the Universe, Hermes, of whom Khurum(Hiram) is the representative, that is one of the lights of the Lodge. To study and seek to interpret correctly the symbols of the Universe, is the work of the sage and philosopher. It is to decipher the writing of God, and penetrate into His thoughts. … Wisdom, Strength, and Beauty, are the perfections of everything, and nothing can endure without them. … there should be Wisdom to conceive, Strength to support, and Beauty to adorn, all great and important undertakings. The Wisdom and Power of the Deity are in equilibrium. Omnipotent power, infinite, and existing alone, would necessarily not be constrained to consistency. The laws of God are not obligatory on us because they are the enactments of His POWER, or the expression of His WILL; but because they express His infinite WISDOM. They are not right because they are His laws, but His laws because they are right. …the wisdom of the Architect is displayed in combining, as only a skillful Architect can do, and as God has done everywhere,–for example, in the tree, the human frame, the egg, the cells of the honeycomb–strength, with grace, beauty, symmetry, proportion, lightness, ornamentation. Harmony in this, as in all the Divine, the material, and the human, is the result of equilibrium, of the sympathy and opposite action of contraries; a single Wisdom above them holding the beam of the scales. To reconcile the moral law, human responsibility, free-will, with the absolute power of God; and the existence of evil with His absolute wisdom, and goodness, and mercy,–these are the great enigmas of the Sphinx. The Square is a right angle, formed by two right lines. It is adapted only to a plane surface, and belongs only to geometry, earth-measurement, that trigonometry which deals only with planes, and with the earth, which the ancients supposed to be a plane. The Compass describes circles, and deals with spherical trigonometry, the science of the spheres and heavens. The former, therefore, is an emblem of what concerns the earth and the body; the latter of what concerns the heavens and the soul. … still the divine ever mingles with the human; with the earthly the spiritual intermixes; and there is something spiritual in the commonest duties of life. … woe to that people which, seeking the material only, forgets that it has a soul. Genuflection before the idol or the dollar atrophies the muscle which walks and the will which moves. Hieratic or mercantile absorption diminishes the radiance of a people, lowers its horizon by lowering its level, and deprives it of that understanding of the universal aim, at the same time human and divine, which makes the missionary nations. A free people, forgetting that it has a soul to be cared for, devotes all its energies to its material advancement. The citizens copy after the State, and regard wealth, pomp, and luxury as the great goods of life. Such a nation creates wealth rapidly, and distributes it badly. Thence the two extremes, of monstrous opulence and monstrous misery; all the enjoyment to a few, all the privations to the rest, that is to say, to the people; Privilege, Exception, Monopoly, Feudality, springing up from Labor itself: a false and dangerous situation, which, making Labor a blinded and chained Cyclops, in the mine, at the forge, in the workshop, at the loom, in the field, over poisonous fumes, in miasmatic cells, in unventilated factories, founds public power upon private misery, and plants the greatness of the State in the suffering of the individual. It is a greatness ill constituted, in which all the material elements are combined, and into which no moral element enters. If a people, like a star, has the right of eclipse, the light ought to return. The Sun is the ancient symbol of the life-giving and generative power of the Deity. To the ancients, light was the cause of life; and God was the source from which all light flowed; the essence of Light, the Invisible Fire, developed as flame manifested as light and splendor. The Sun was His manifestation and visible image; and the Sabæans worshiping the Light–God, seemed to worship the Sun, in whom they saw the manifestation of the Deity. The “Master of Life” was the Supreme Deity, above both, and manifested through both; Zeus, the Son of Saturn, become King of the Gods; Horus, son of Osiris and Isis, become the Master of Life; Dionysusor Bacchus, like Mithras, become the author of Light and Life and Truth. The word Prudentia means, in its original and fullest signification, Foresight; and, accordingly, the Blazing Star has been regarded as an emblem of Omniscience, or the All-seeing Eye, which to the Egyptian Initiates was the emblem of Osiris, the Creator. With the YOD in the center, it has the kabbalistic meaning of the Divine Energy, manifested as Light, creating the Universe. The JUSTICE and MERCY of God are in equilibrium, and the result is HARMONY, because a Single and Perfect Wisdom presides over both. Many great deeds are done in the small struggles of life. There is, we are told, a determined though unseen bravery, which defends itself, foot to foot, in the darkness, against the fatal invasion of necessity and of baseness. There are noble and mysterious triumphs, which no eye sees, which no renown rewards, which no flourish of trumpets salutes. Life, misfortune, isolation, abandonment, poverty, are battle-fields, which have their heroes, – heroes obscure, but sometimes greater than those who become illustrious. The Mason should struggle in the same manner, and with the same bravery, against those invasions of necessity and baseness, which come to nations as well as to men. He should meet them, too, foot to foot, even in the darkness, and protest against the national wrongs and follies; against usurpation and the first inroads of that hydra, Tyranny. The protest of the Right against the Fact persists forever. Whatever occurs, we should have Faith in the Justice and over-ruling Wisdom of God, and Hope for the Future, and Loving-kindness for those who are in error. God makes visible to men His will in events; an obscure text, written in a mysterious language. Men make their translations of it forthwith, hasty, incorrect, full of faults, omissions, and misreading. It is absurd to say that Error, wounded, writhes in pain, and dies amid her worshipers. Truth conquers slowly. There is a wondrous vitality in Error. Truth, indeed, for the most part, shoots over the heads of the masses; or if an error is prostrated for a moment, it is up again in a moment, and as vigorous as ever. It will not die when the brains are out, and the most stupid and irrational errors are the longest-lived. Masonry should be an energy; finding its aim and effect in the amelioration of mankind. Morality is Faith in full bloom. Contemplation should lead to action, and the absolute be practical; the ideal be made air and food and drink to the human mind. Wisdom is a sacred communion. It is only on that condition that it ceases to be a sterile love of Science, and becomes the one and supreme method by which to unite Humanity and arouse it to concerted action. Then Philosophy becomes Religion. To be true, and to seek to find and learn the Truth, are the great objects of every good Mason.